Extraordinary meets beautiful. Covering the roof in Postal Place it changes from sunrise to sunset. 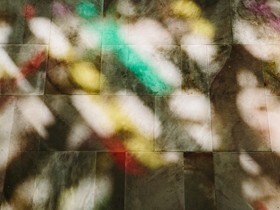 Light plays across the multi-coloured strands to create almost a second artwork through reflection. Nike Savvas is renowned for her physically immersive and optically dazzling installations and her installation at 140 is no different. ‘Rapture’ for 140 will offer a glimpse of a different world layered in colour-coded bands of acrylic suspended in space. The canopy of suspended colour will effectively create an environment that is both wondrous and an exciting world of magic and escape. Located in Postal Place, down Railway Lane off Murray St Mall.